The internet is for lovers – of ’70s psychodelia and Brazilian tropicalia, that is. What started out as a mere intercontinental email chain of drum beats and keyboard blips manifested itself into the album straight out of 1974, Celestial Electric, the electro-soul lovechild from first-time collaborators AM and Shawn Lee. Both established artists on their own accord, LA-based AM and London-expat Lee deliver an album full of synthtastic tracks to make even the most hardened Echo Park hipster sway. Opening track “City Boy” sets the scene for the record, showing off AM’s Barry Gibb-esque soaring falsetto that floats in and out of many of the songs on the album. The single “Dark Into Light,” a track previously released on Record Store Day back in April, offers a luminescent musical landscape amid heavy bass lines and dream-worthy harmonies. For the rhythm-inclined, look to “Promises Are Never Far From Lies” and the solely instrumental “The Signal” to pack enough groove to get the Troubadour masses shuffling in their loafer-clad feet. 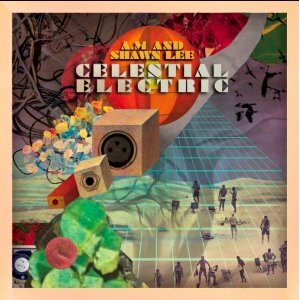 For their virgin voyage as a creative pair, AM and Shawn Lee leave much left to be desired in Celestial Electric, as in I desire to hear more and hope this isn’t the only album created via the interwebs from the duo a la The Postal Service. Celestial Electric exudes just the right amount of swagger and soul to have us reminisce the days of yore without wanting to fully commit to bellbottoms and feathered hair again. Cheers to keeping it funky, my friends.